Is there a better way to show your mother you care than Personalized Jewelry? Our unique custom made jewelry is the perfect Mother’s Day gift or the perfect Christmas jewelry gift; one she will appreciate for years to come. Our Mothers Collection is filled with great gift ideas that your mother is sure to love! Moms love our name necklaces, and they are easy for a love to order, since all you need to know is the name you want on it. Chain length is not much of a problem as the average women’s chain length is 16 inches or you can go with 18 inches if you want the necklace to hang a little lower. Consult with our chain length guide for further information. 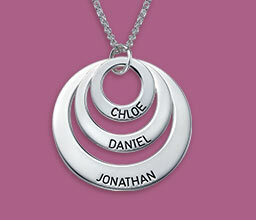 We also carry a tremendous variety of necklaces that can be personalized with any inscription. An engraved necklace works really as a mom necklace sort of gift for Mother's Day. Our jewelry is great because of the personal aspect; it isn’t just any piece of regular jewelry. Another of our more favorite items is the Silver Mother’s Necklace with Children Charms, beloved because one can add and engrave the names of all their loved ones onto cute little kids pendants. 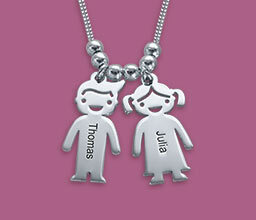 Moms love jewelry that show off their family, especially when showing off each child’s charm with a personalized twist. 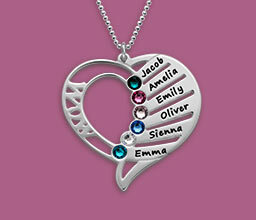 An engraved necklace with heart cut out is also a sweet piece that your mother will appreciate. Recently family tree necklaces have been making waves with mother’s all over the world. These beautiful necklaces feature the engravings of your family members names, along with a tree, representing the strong unifying bond that families have. If you’re looking for a gift for a mom with more than a few kids, this will definitely bring tears of joy to her eyes. Are you looking for a different types of jewelry, such as an initial necklace, or a gorgeous birthstone necklace? Moms will absolutely relish the thought put into these personalized gifts! You can also choose from our wide variety of heart necklaces which you can order in silver, gold plated, or even gold! Another unique option is giving your mom a personalized ring. A ring is a classic gift, simple yet oh so special. If you have your wife’s or mother’s ring size, you will cherish the moment when she puts on this distinct gift and her face lights up. 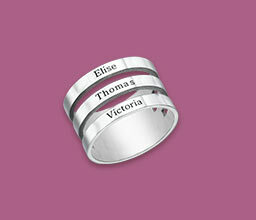 Re-sizing the ring is free as well, so if you are a little off we can always fix it for you. If mom has two or three kids, why not have some fun with the monogram ring? If it’s two kids you can have the left and right initial as the children’s first initial, and the middle initial as the family’s last name! For three kids you can have each of the kids three first names incorporated in the ring. If you are having trouble figuring out mom’s ring size, check out our guide for secretly determining her ring size. All our jewelry is 100% custom made, and thus makes a perfect personal gift for mothers and grandmothers alike. Check out our Mother’s Collection for other jewelry mom will love! This year make it personal, with a gift from MyNameNecklace! Happy Mother’s Day!